BUSINESS GROUPS HAVE said that it shouldn’t be essential for workplaces to close during a time of a red alert weather warning, despite the warning this week urging people to stay indoors. Before the storm hit the country, Taoiseach Leo Varadkar said that people should heed the warnings given by the authorities while Minister Eoghan Murphy said that the “onus is on the employer to put the safety of staff at their forefront”. The Taoiseach also said, however, that employers should make their own choice on the matter and that a “blanket instruction” on all businesses to close would be inappropriate. A proposed Sinn Féin bill would make it compulsory for employers to close its place of business during a red alert, and not penalise their employees for doing so, but it has not received government support. What is a red alert? A Met Éireann red alert is one which advises people to take action. Prior to this week’s nationwide red alert, the previous similar alert issued was during Storm Ophelia in October 2017, where three people died. Authorities were abundantly clear in their advice ahead of the worst of the storm this week. Varadkar warned in a public address that in a blizzard scenario it could be “total wipeout” outdoors, and that between 4pm on Thursday and 12 noon on Friday the country is on “red alert”. National Emergency Coordination Group chair Sean Hogan was even more unequivocal. He said on Wednesday: “Do not be out there from 4pm tomorrow. This is like Ophelia, it is a different type of safety concern but it is a safety concern. If people need to travel they need to consider how they will be home safely by 4pm tomorrow. He said employers will need to consider whether it will be safe to ask employees to come to work over the coming days. “We’re hoping the damage won’t be like what it was with Ophelia but we are in uncertain territory here,” said Hogan. He said that if people are out and about in the weather on Thursday and Friday they might get disorientated and lost. He noted there were a number of deaths of people outdoors in 2010. Sinn Féin wants this kind of advice in a red alert warning formalised in legislation. Under the bill, an employer would be required to, in the event of the place of work being subject to a red weather alert, “close such place and make reasonable measures to inform all employees to stay away from it for the duration of that warning”. Another provision would be to “ensure that an employee who stays away from such place of work for the duration of a Status Red severe weather warning is not penalised because of such action”. Sinn Féin Imelda Munster TD said: “This bill will provide for the safety of employees during certain severe weather warnings. It will enhance public safety and ensure the safety of rescue service personnel during such a weather warning. There was a significant level of confusion in the aftermath of Storm Ophelia regarding what actions businesses in the private sector and self-employed persons should take during an extreme weather warning… As legislators we must now take measures to guide employers, protect workers and strengthen the powers of emergency services in the case of future warnings. Business groups, however, think that such measures would go too far. 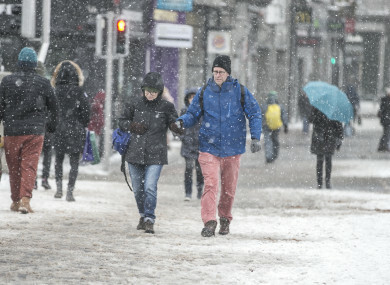 While groups such as Ibec and Isme urged employers to heed the government’s warnings, and treat the safety of their staff with the utmost seriousness, some feel a blanket ban on a business opening in such a weather event goes too far. Graeme McQueen, head of public affairs at Dublin Chamber, says that businesses by and large heeded the advice and took sensible measures in given the weather conditions. He told TheJournal.ie on Thursday: “Ultimately it’s up to the individual business in terms of what they decide to do. However, the warnings that have been issued by the various authorities are clear and should be adhered to. The view of Dublin Chamber remains that people come first in this situation. Given the seriousness of the weather warnings, we would encourage employers to look after their staff – particularly given the lack of public transport available. For the most part, common sense has prevailed, with a lot of companies allowing staff to work from home. This will be the case again on Friday. ISME CEO Neil McDonnell told TheJournal.ie that any proposals to enforce the closure of businesses in such events was unworkable. He said: “We don’t believe it would be appropriate to order businesses to shut when there is a red alert warning. Who would be responsible for deciding which businesses to shut, and which to leave open. Many ‘non-essential’ workplaces are really important to our daily lives. Bakers, convenience stores, forecourts, HSE outworkers, man-in-van services, utilities services; all of these become ‘essential’ when we need them. Invoking some law to direct the shut-down of everything would simply be a cop-out. McDonnell added that workers are already protected under the Safety Health and Welfare at Work Act. Read: What’s the difference between ‘The Beast’ and ‘Storm Emma’? Email “'Simply a cop-out': Should businesses be forced to shut during a red alert warning?”. Feedback on “'Simply a cop-out': Should businesses be forced to shut during a red alert warning?”.